Oh, how sad to lose such a gem! I suppose it was only a matter of time though. Well put Earl. You and I trudged that same path on Comic Book Wednesdays. I remember as a kid thinking I needed to supplement Superman with something high brow from the bookstore, like Three Investigators / Madeline L'Engle / Ursula LeGuin / Moorcock. Funny, I still feel the same way now. Hopefully Wee Book Inn doesn't get sucked into the hole left by the Great Online Book Homogenizers. Whatever happened to just going for a stroll and finding a gem, anyways? Costumers? You had random people dress you and abuse you? That's a pretty narrow fetish, how could you afford that? On a serious note, I too, spent a great deal of time, and no small amount of money, in Greenwoods. One of my sisters used to work there, too. I loved that store, and fumed when Chapters chose to set up shop only a couple of blocks away. Between online bookstores, big box book stores, and ebooks, these independent stores can't last. Which is truly tragic. I see a fair amount of your writing as going into a forest and pointing out one particular tree from all the others. "This is my tree," you say. In this case, you're standing in a denuded field going, "This is where my tree used to be." To me this makes sense from the blog world, because you write about personal things, and you write about what you know. However, I also think that you are missing a much larger view. The book publishing and distribution industry is beset with inefficiency and a surfeit of stuffy tradition. It's the kind of thing that's woefully undervalued in the present economy, which is also why publisher/distributors are such lucrative investments. All one has to do is trash the inefficiency and start a new paradigm of service, and the customers will beat a path to your business. And that's exactly what Amazon has done. If you're standing in the what's left of the forest looking at the sad Charlie-Brownian remains of your own personal tree, be aware of the predators that lurk among the overhanging branches! This article, although somewhat out of date, provides a powerful and cogent explanation of how New Media is doing battle with Legacy Media, and how the customer becomes marginalized as a result. The good news is that there was absoultely nothing you could do to save Greenwoods so you can stop feeling guilty on that count. 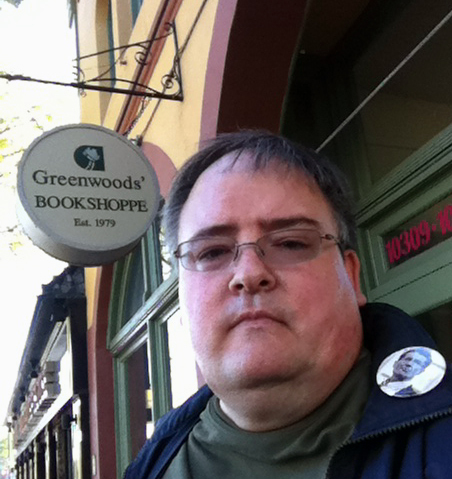 Even if every man, woman, and child in Edmonton bought a book from Greenwoods every day, they'd still be sunk. What a chilling prospect! In a few years, we won't be choosing bookstores, we'll be choosing distributors, and the only way we will do that is by buying those damned e-books. You want a Grisham? You'll have to own an Apple. You want Hemingway? You can only read him on a Kindle. Kobayashi exclusively on a Kobo. Bradbury on a Rocketman. You won't be able to buy an independent book again, as we all walk around carrying our wasteful little hand-helds that mark us each as indelible information points on the Google grid. The very sad thing is that the greatest minds of our generation are not occupied with building our next mission to mars, or curing cancer, or even with running the CERN LHC. Certainly not in the arts, creating words, music, pictures or dance for the ages. The very smartest and most ambitious people in the world are completely employed in the information-based e-business of making sure that a specific ad will be targeted at the right time to any given person on the planet. And that's the whole show right there. All other considerations are secondary. I don't know. There's a lot of truth in what Jeffemy says, we all know it. I think it was because of aLibris that I found a copy of "The Great Comic Book Heroes", a childhood library favorite that I would never have found in Greenwoods, Wee Book Inn, or others. But personally, I'm still a guy that likes to go out and browse. I go to the library to find something specific, I end up finding it, and I get two books on the shelf right next to it. It's harder these days, especially with kids, to get out and do that. But I like the feel and smell of a bookstore, and the unplanned surprises that await. It's hard to replicate that. Once it's gone I have a feeling we'll miss it deeply. If small booksellers' time has come, fine, I will get a little Charlie Brownian over it. And my friend Linus, he's got a blue blanket for the loneliest and scraggliest of the remaining few.